Category Archives: Where’d it come from? 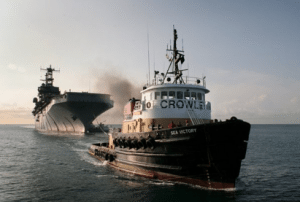 We are pleased that the U.S. Navy has entrusted TITAN with this contract and look forward to providing the Navy the same high level of service that Crowley has provided for the last 34 years. As a salvage industry leader, TITAN is well positioned to take on this contract. TITAN’s long record of global salvage, wreck removal and response to natural disasters prepares us well should the Navy call. Filed under Dissertation Digest, Shipwreck culture, Where'd it come from? There are high winds and a strange, warm, misty rain like the end of the world. It is shipwreck weather, with two Danish sailors rescued off the coast of Cork in gale force winds and a haul of silver worth 127 million found lately off the coast of Galway. We have been cowering inside by the fire most of the week. The quality and athleticism of the Connemara pony originates from Spanish bloodlines. When the Armada was wrecked off the rocky Irish shore in 1588, the white Spanish horses (something like today’s Lipizzaners) swam in and bred with the tough little native ponies. Bermingham met with some success, but in the end she concluded: “Maybe trying to join up with the whole world collapsing around us in a hurricane was a bit ambitious; I am trying not to take it personally…” I wouldn’t–many thanks for the fantastic post (and good luck with your pony)! Shipwreck symbols – where’d they come from? Whoever designed this symbol for “wreck showing any portion of hull or superstructure at level of chart datum” was a genius. It’s not the only symbol for a shipwreck used on American nautical charts, but it’s my favorite (NOAA lists at least dozen shipwreck symbols). I’m such a fan that I made it my twitter and wordpress picture. It does everything a good symbol should do–it’s easily recognizable, memorable, and just plain works. Better yet, it captures the complexity of a shipwreck as an event, process, and place. So who designed it? When did they do it? Wish I knew. An quick internet search turned up nothing. So I looked at a couple of historic charts on the NOAA website and found two charts depicting the region around the port of New York which help… a bit. 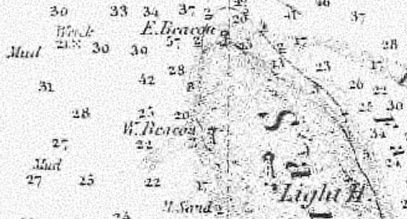 The oldest, “New York Bay and Harbor and the Environs,” was printed in 1845 and shows a wreck just northwest of Sandy Hook light. (Hard to see, but look near the top left between mud and the 30). On this chart “X” marks the spot. 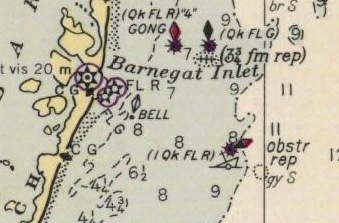 Jump ahead a century to the 1944 chart titled “Approaches to New York.” See the unidentified wreck southeast of Barnegat Inlet? Pretty close to the current design, but not quite (and definitely not as effective). There’s also a “Dangerous wreck, depth unknown”–the football-looking symbol–between Barnegat and Inlet. That’s all I know at this point. I’m putting off skimming the annual reports of the Coast Survey or spending any more time looking at old charts than I already do with the hope that someone out there might know the story of the shipwreck symbol. Can you help me track down its design history? If you can, many thanks! If not, check back to see how it goes. Filed under Where'd it come from?